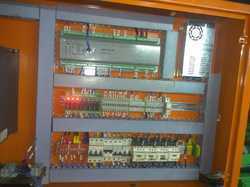 Successfully installed and Commissioned with our injection controller with servo, to the Chennai Customer Sicame connectors India pvt Ltd. 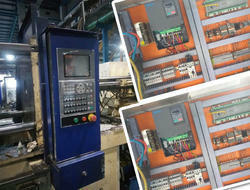 The machine Engel 120ton with ************ controller. The machine got frequent problem of pressure leakage and tonnage . solved this issue by replacing with our controller and servo. 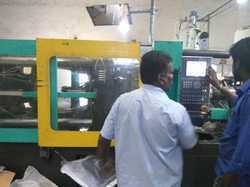 Now the machine running without any problem..
Karthigeya Plastics & Technologies is an ISO/ TS 16949:2009 certified organization working on the principles of Lean manufacturing system to provide one stop solutions for injection molded parts ranging from automotive, Consumer Electronics & appliances to minute parts involving high precision, to a wide spectrum of clientele including SLLumax, Visteon, India Japan Lighting, Schneider Electric, Seco Komos, Samsung, Dover India, Whirlpool, Panasonic, Renault Nissan, Mahle & Wipro. The plant has a capacity of running over 20 machines starting from 60 Tonnage to 1200 Tonnages. The company is focused in converting the machineries with robotics. For the first time, They had installed 5 axis robot on 350 tonnage machine which is processing cluster parts for automobile application. N2S technologies Pvt. Ltd had supplied this Yantong robot which have been successfully installed by the service team and running well. Due to few changes in parameter settings and some updating issues, it has few homing issue. From our company, We organized a technical engineer from china on behalf of yantong robot had visited the company with our Chennai engineer and checked the robot functioning and successfully resolved the issue. The customer witnessed after the robot running well with the sequence and appreciated us. In future we will get more orders on robot on their machines. Service and Commissioning of AIVIV 250 Ton Machine with our Injection Molding Controller GMC1108E with 10" HMI @ Raidiant polymer, Shahibabad- UP. Previously the machine was faced problem with existing ******** controller mother board. it was analysed and recommended to replace. now the machine was working good with 100% satisfication. The IPLEX'18, the 9th Edition is being held at the Hitex Exhibition in Hyderabad, India from August 3rd to 6th 2018. It is supported immensely by the industries across India & Globe. It has the patronage from the major polymer producers and Govt. of India along with local governments. . The conducting of these IPLEX across all the southern states is to focus local entrepreneurs and expose them to the globe to have more business coverage and to reap the benefit of globalization in form of Exports to international standards. This in turn benefits all the industries connected with plastic and boosts our image among the global competitors. 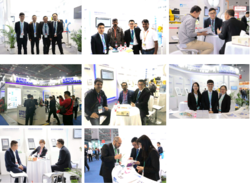 We, N2S technologies had participated in the exhibition as a visitor and approached all exhibitors especially machine manufacturers like Sardha machinery, STM machinery, Supermac, Gold coin etc., to widen our marketing web and to increase our product sales and promote our products in injection molding machinery market. 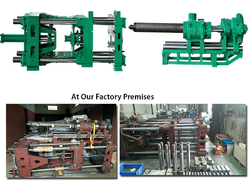 Most of the positive feedbacks and responses came from the machine manufacturers about our products. Hopper dryer have a large list of valuebale clients across india as well as oversease. We belive in client satisfaction and trust at any cost.We love to make relation rather than business because relation are made for forever. 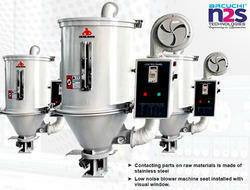 In order to meet assorted need of the customers, our firm is offering a wide array of Hopper Dryer. Our offered range of products is precisely tested on assorted parameters at our vendors’ end in order to make sure that we are offering only defect-free range of products to the customers’ end. In addition to this, keeping in mind assorted needs of the clients we offer this product in assorted needs of the clients. As technology and automatic capabilities continue to advance, plastic injection molding — and the plastics industry at large — is also continuing to evolve. Today, for instance, lighter-weight materials are becoming increasingly popular, and automation is cutting down on costs and labor needs. Enhanced customization options, meanwhile, are allowing for more tailored plastic solutions. And as eco-friendly initiatives continue to pick up speed — due both to new regulations and shifting consumer preferences — reclaimable, recyclable, and renewable plastics are becoming increasingly popular. Ps emitted to the atmosphere to heat the mold.. The impact of automation has been felt in virtually every industry, but the increased deployment of automated tools and robotics in the injection molding industry stands to be monumental. 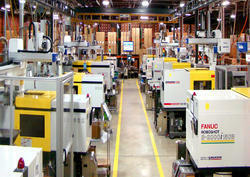 Automated robots boast speed, accuracy, agility and adaptability, which allows for significant increases in production. In an effort to contribute to eco-friendliness and sustainability, the injection molding industry as a whole has been working diligently to decrease energy consumption and create bio-based and recyclable products. Thanks to advances in engineering, newer injection molding equipment now uses between 20%-50% less energy compared to those released just 10 years ago. Hydraulic clamping unit are characterized by numerous advantages. 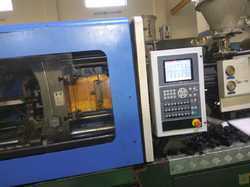 The most important of these include compensation of platen distortion caused by injection pressure maintained by hydraulic oil pressure which in turn has a positive effect on extending life of injection molds, particularly molds complex geometrically. Hydraulic clamping unit features with high performance, free programming speed and pressures on the opening / closing stroke, sensitive low pressure mold protection, and the ability to apply compression injection molding technology. Unlike other solutions, the hydraulic clamping unit is commonly used for all sizes of injection molding machines. Toggle clamps: Toggle clamps have various designs. They have an actuator that moves the crosshead forward, extending the toggle link so it pushes the moving platen toward a closed position. At the beginning of a movement, the mechanical advantage is low and the speed is high. Near the end of the stroke, the opposite is true. As a result, toggle clamps provide high speed and high force at different points in the cycle when they’re desirable. Hydraulic cylinders or ball screws driven by electric motors actuate them. Toggle-clamp units are generally best suited for low-tonnage machines. Hydraulic clamps: Hydraulic clamps are used on higher-tonnage injection molding machines. They typically range between 1,300 and 8,900 kilonewtons (150 and 1,000 tons). The units are more flexible than toggle clamps in regard to setting the tonnage at given positions during a stroke. We provide service for the customers with our portable Injection molding controller demo kit. 90 Ton Injection Molding Machine Commissioned with our 8" LCD HMI & PLC for our Customer on emergency basis. The heat balance control of injection mold injection molding machine and mold thermal conductivity is the key to producing injection molded parts. Internal mold, made of plastic (such as thermoplastics) caused by thermal radiation heat transfer to the material and mold steel, heat conduction through the fluid circulating handed. In addition, the heat transfer by thermal radiation into the atmosphere and is mold. Thermal conductivity of the fluid is absorbed by the mold temperature to the heat away. Mold thermal equilibrium can be described as: P = Pm-Ps. Where P is the mold temperature away the heat; Pm plastic into heat; Ps emitted to the atmosphere to heat the mold.. 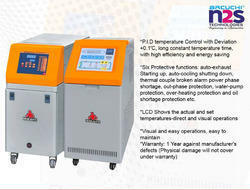 The purpose of controlling mold temperature and mold temperature on the impact of injection molded parts injection molding process, the main purpose of mold temperature control of the mold is heated to one temperature, the second is to maintain a constant temperature in the mold temperature. The success of these two points do, you can optimize the cycle time, thereby ensuring the stability of high-quality injection molded parts. Mold temperature will affect the surface quality, liquidity, shrinkage, deformation and molding cycle aspects. Mold temperature too high or inadequate for the different materials will have different effects. Of thermoplastics, the mold temperature is usually a little higher will improve the surface quality and liquidity, but will extend the cooling time and injection molding cycle. Lower mold temperature will reduce the shrinkage in the mold, but will increase after the injection molding mold shrinkage. While thermosets, the higher mold temperature will usually reduce cycle time and cooling time from part time decision. In addition, plastic processing, the higher mold temperature will reduce the plasticizing time, reduce cycle times.. Please Visit our stall to speak with our experts. 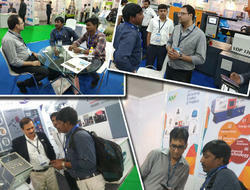 Thank you all for honoring us by visiting our stand. Product Model and Name:GMC1008 Horizontal controller. Detailed Notes of Work Done: SSPT 150tonnage toggle type, machine ,original controller issue & some pressure issue in machine, we had installed successfully done our arcuchi controller presently machine is running with out any problem.. Status of Work:machine running good and with out problem.. Product Model and Name: GMC1108E Horizontal controller. Status of Work: machine running good and with out problem.. 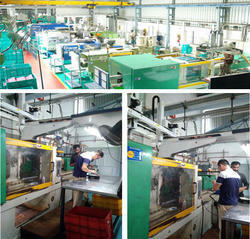 Installed and Commissioned 260 Ton Nessie Injection Molding Machine with our 10" HMI & PLC for New National, Delhi. 750 Ton Injection Molding Machine Installed and Commissioned with our 15" LCD HMI & PLC for the customer Angel Plastics,Chittor,AndraPradesh. Existing Problem: Original controller damaged. Work Status:Natraj 100tonnage toggle type, machine ,original controller was damaged we had installed successfully done our arcuchi controller presently machine is running with out any problem..
We are devotedly engaged in imparting Installation and Commission Services for our clients. These services are rendered by our highly experienced professionals by utilizing latest techniques in strict adherence with the set universal norms. Further, these services are highly valued for their accurate results, timely execution and high level of impact. We offer these services to our honorable clients as per their needs. Old Imported Kawaguchi 350 Ton Molding Machine Comissioned with our 15" High Speed Injection Molding Controller. Detailed Notes of Work Done: Assisted company technician for removing of existing controller and interfacing of all I/O's to new PLC. 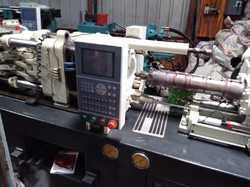 Testing & commissioning of machine.